I started the show 3o minutes early this week so you folks get some extra music in your weekly podcast. Bonus! Had another installment of Diggin’ Through the Record Crate and a Beer Minute featuring one of my favorite beers of all time. On top of that I served up some Aussie rock, punk, rockabilly, trash, garage, country, psychobilly and other stuff to corrupt the youth of America. See you next week, folks. Thanks for listening! 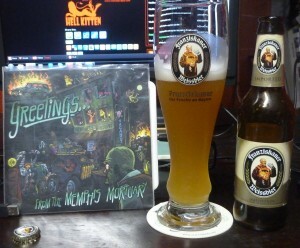 This entry was posted in Podcast and tagged Ale, Beer Minute, Country, Diggin' Through the Record Crate, garage, Hefe-Weissbier, power pop, psychobilly, punk rock, rock & roll, rockabilly, Underground Medicine. Bookmark the permalink.